(2) MetalTech 7 ft. x 19 in. Aluminum Scaffold Platform with Plywood Decks, M-MPP719. In nice condition. Decks are built with a rugged 5/8 in. 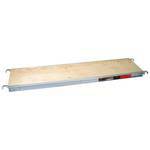 thick plywood deck and platform crossbeams to evenly distribute the load. Constructed to work with both standard and arched frames. Load capacity of 75 lbs. per sq. ft. Anti pop-up sliding lock system at each end for added safety and security. MetalTech Saferstack 7 ft. x 4 ft. Scaffold Cross Brace M-MC4884 - 10 Cross Braces in nice condition and includes one extra bar. M-MC4884. Brace is used for both standard and arched (walk-through) scaffolding towers to reach their full load capacity. Designed to help prevent stacked frames from sliding. Installed hole size measures 96-3/4 in. center to center. Designed for scaffold frames that have 4 ft. locking pin spacing.